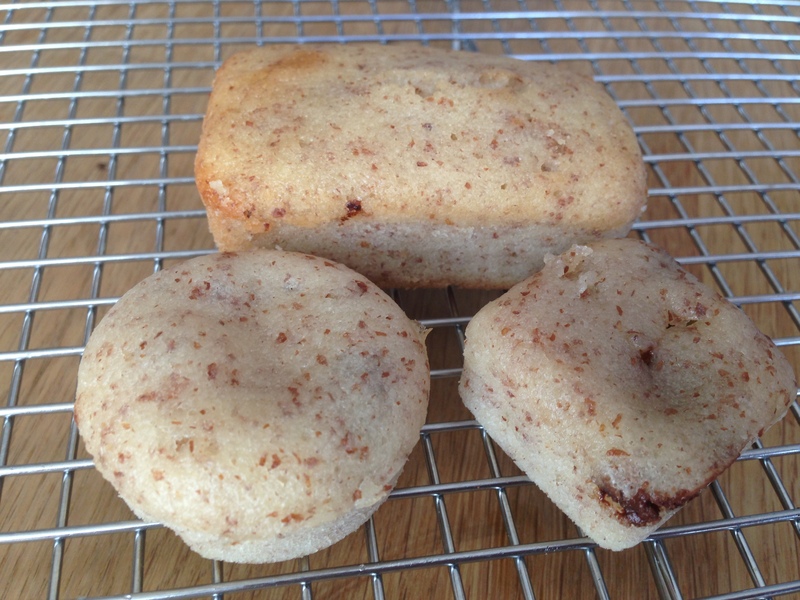 For years, my skepticism that gluten-free flours could produce the “right” baked goods texture made me highly resistant to experimenting with gluten-free baking. But during a recent trip the to the Williams Sonoma outlet, a bag of Cup4Cup, a gluten-free flour developed by a chef, finally made its way into my shopping basket. 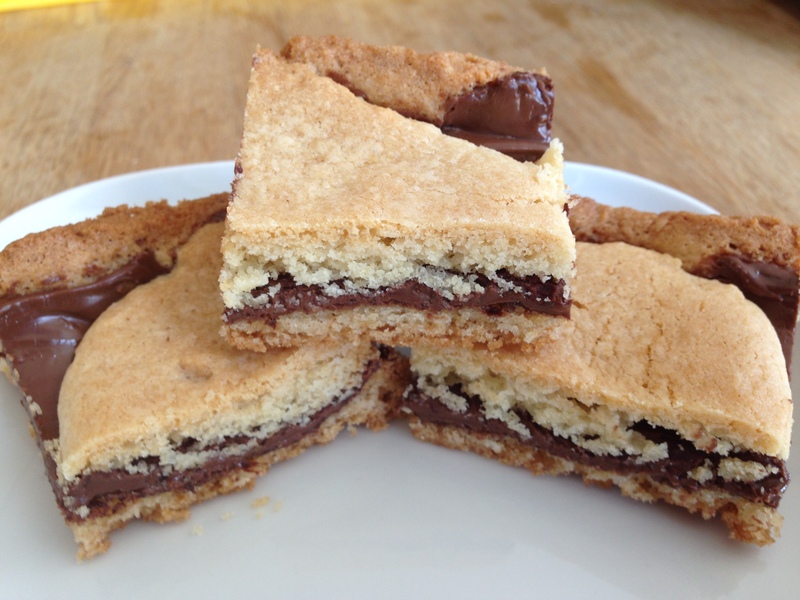 My first experiment was with Nutella Sugar Cookie Bars, and what a perfect recipe to start off my foray into gluten-free baking. 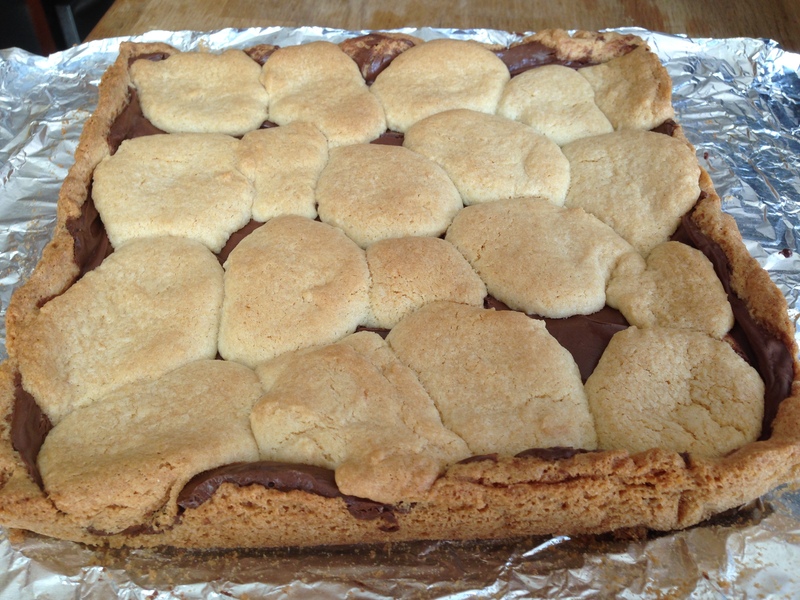 The cookie bars were soft but not crumbly or dry, and the Nutella made these even more over the top delicious. I can already hear the much rejoicing among my gluten-free friends. Cup4Cup gluten-free flour is pretty amazing. It’s the only gluten-free flour I’ve tried so far, but I still think it’s amazing. 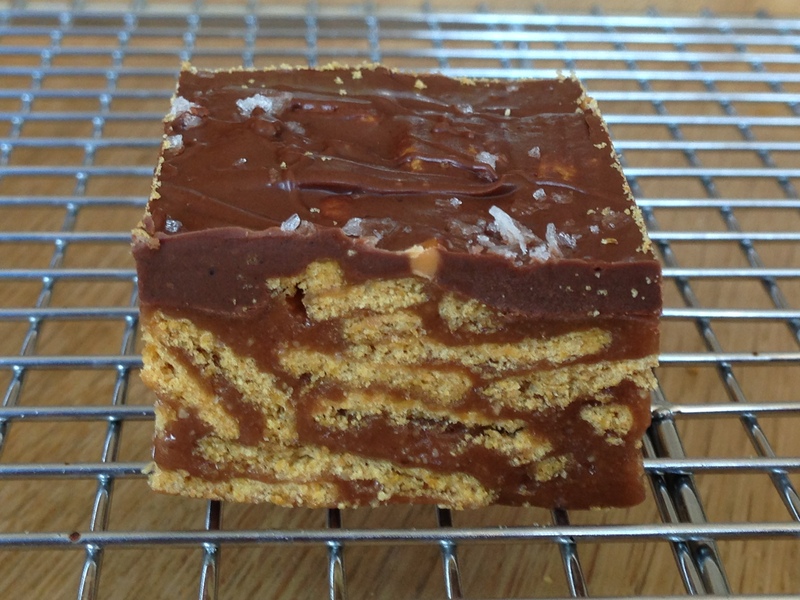 …the side view reveals all the delicious layers. Preheat the oven to 350°F. Spray a non-stick 9” x 9” pan with cooking spray. In a bowl mix together the Cup4Cup flour, baking soda, salt, and cream of tartar. In a stand mixer, cream together the butter and sugar on medium speed. Scrape down the sides and bottom of the bowl. Add the egg and vanilla to the butter-sugar mixture, and mix on medium speed until combined. Add the dry ingredients to the mixture, and mix on low until a dough is formed. Place half of the dough into the bottom the baking dish, and use your fingers to spread it out into an even layer. Spread the Nutella evenly over the top. Take the remaining dough and scoop it by the tablespoon to cover most of the Nutella. 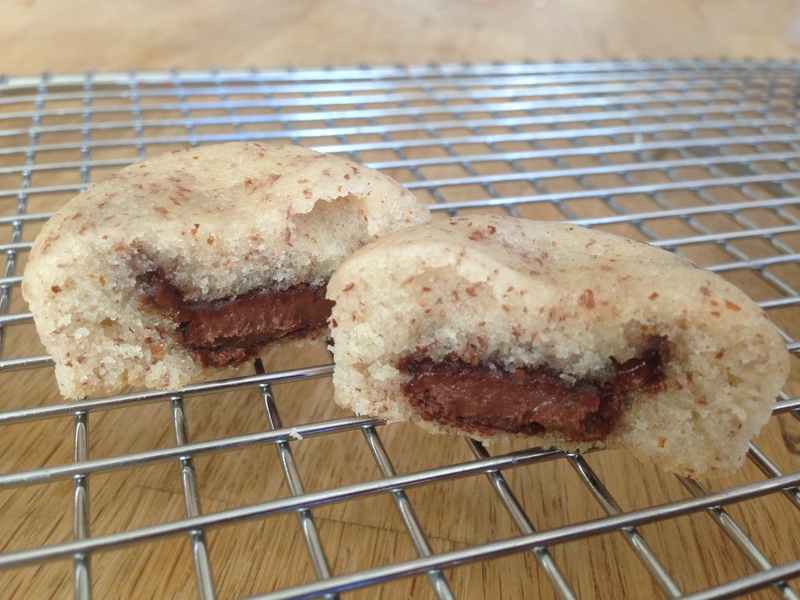 Spaces of Nutella between the dough are ok.
Bake for 30 minutes until baked through and light golden brown. Hello Gorgeous! Have you ever seen a better looking cereal bar? This beauty is a combination of caramel + Nutella + chocolate chips + butterscotch chips + cashew butter + honey graham cereal with a sprinkle of Maldon sea salt. Sounds fancy, but it all comes together in one pot, and the chocolate-butterscotch spread can be melted in the microwave. 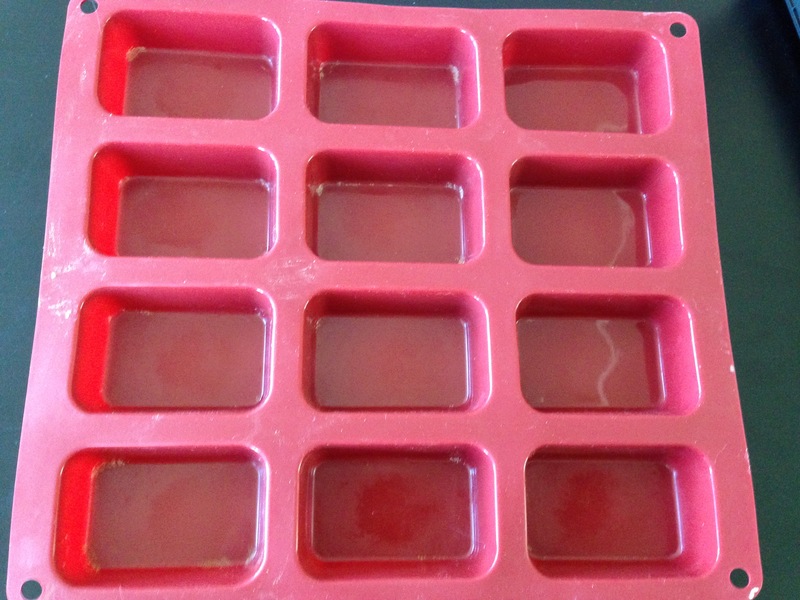 All you need is a slightly strong arm to stir together all the ingredients and some patience to wait for the slab to firm up before cutting into squares. If you’ve made rice krispie treats before, then you can make these “gourmet” Caramel Nutella Cashew Graham Scotcheroos. Line a 9 x 13-inch baking pan with parchment paper, or line with greased/buttered aluminum foil. In a large saucepan over medium heat, bring the sugar and corn syrup to a full boil (the sugar mixture will not change color) and then remove from heat. Stir the cashew butter and Nutella into the sugar mixture until smooth and well mixed. Stir graham cereal into the mixture until the cereal is completely coated. Working quickly (the mixture will start to firm up fairly quickly), press the mixture into the prepared pan. I used parchment paper to help press/pack the cereal mixture into the pan. Make sure the top is smooth. Set aside. Melt the chocolate and butterscotch chips together over the stove or in a microwave, stirring gently until smooth and well-blended. The butterscotch chips make take a little longer to melt than the chocolate, but keep gently heating and stirring until they are well combined. Spread over the rice cereal mixture. Sprinkle the top lightly with sea salt. Let cool until set. I put mine in the refrigerator for 10-15 minutes to harden the chocolate butterscotch topping a bit. Once cool, cut into small bars with a sharp knife. If only I could approach some of my other resolutions with as much fervor as I have been doing to whittle down my Nutella overstock. 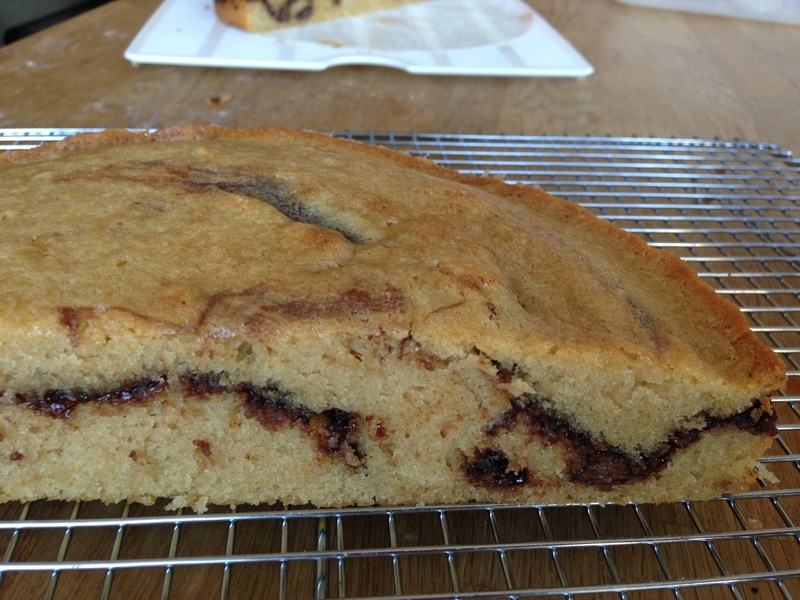 Next up in Nutella-themed baked goods is this Nutella Swirl Vanilla Cake. Because the vanilla cake is based on a pound cake recipe, it’s a little denser and richer than your usual crumbly vanilla cake which means that it solidly supports the thick ribbon of Nutella running through the center. No frosting needed for this cake as the Nutella provides just the right amount of sweetness. 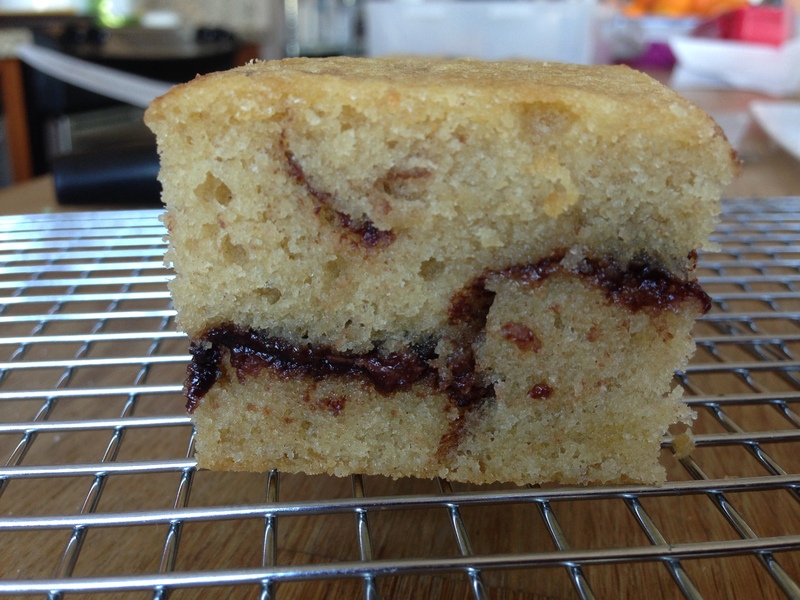 From the outside, this Nutella Swirled Vanilla Cake doesn’t look very impressive. 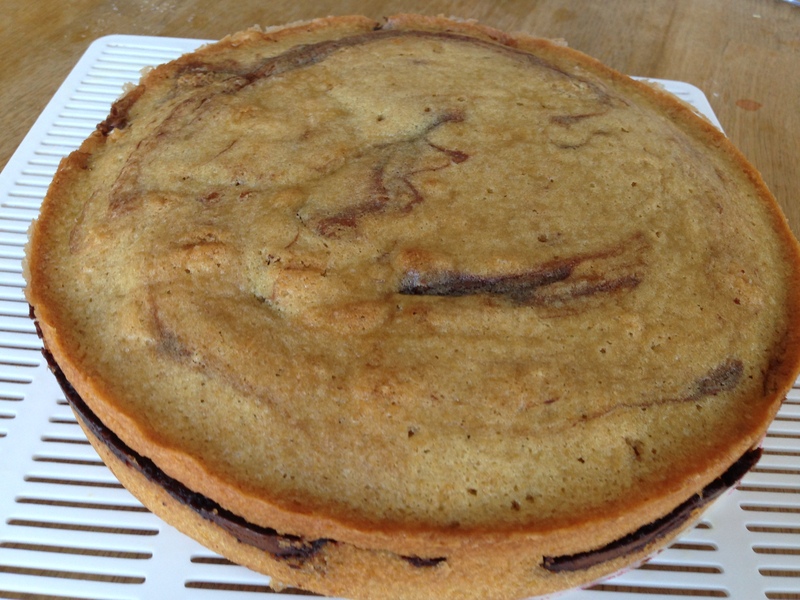 But hidden inside is a thick swirl of Nutella weaving it’s way through the cake. And here’s the perfect bite for you. Preheat the oven to 325°. Line the bottom of a 9×2 inch round cake pan with parchment paper, and lightly spray the sides of the pan with baking spray. In a medium bowl, whisk the flour with the baking powder, cinnamon, and salt. In separate small bowl, lightly beat the eggs with the vanilla. In the bowl of an electric mixer (or in a large bowl using a handheld mixer), beat the butter with the sugar at medium-high speed until fluffy and light. With the mixer at medium-low speed, gradually beat in the egg mixture until fully incorporated. Add the flour mixture in 3 batches, beating at low speed between additions until just incorporated. Do not overmix. Spread half of the cake batter in the prepared pan. Then spread the Nutella on top, leaving a 1/4 inch border of cake showing. Spread the other half of the cake batter on top of the Nutella. Lightly swirl the Nutella into the batter with a butter knife (Do not overmix.). Tap the pan on the counter to settle any air bubbles. Bake the cake for about 32-37 minutes, until a toothpick inserted in the center comes out clean. Let the cake cool in the pan for 15 minutes. Invert the cake onto a wire rack, turn it right side up, and let it cool completely. Recently I went to Costco and stocked up on Nutella… forgetting that the last time I went to Costco, I also stocked up on Nutella. So, my current Nutella overstock situation calls for a strong effort to make all things Nutella, starting with these Black-Bottomed Nutella Swirl Mini Cheesecakes (which in a nutshell is cheesecake in cupcake form). 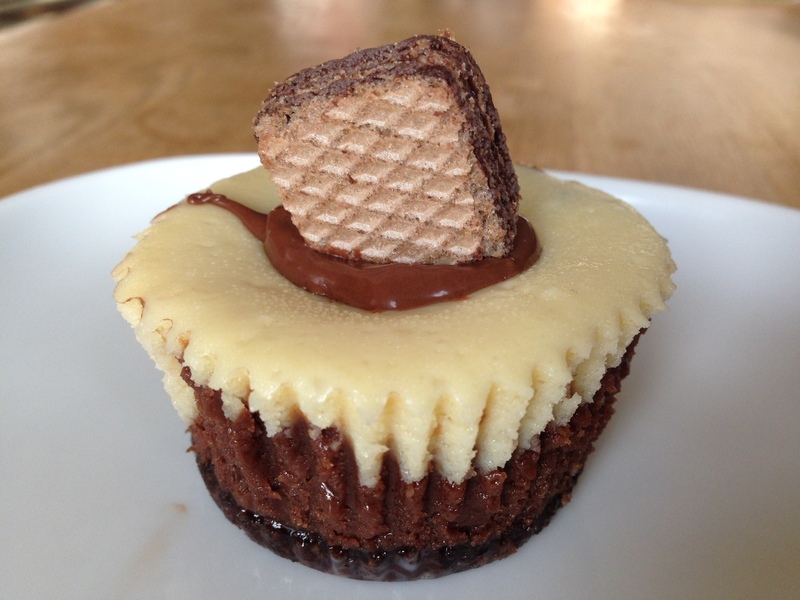 Starting from bottom to top, this tasty little treat consists of a firm chocolate wafer crust (that holds up really well and doesn’t crumble like other crusts), a layer of rich Nutella cheesecake, and a layer of smooth, creamy vanilla cheesecake, all topped with a dark chocolate wafer cookie perched on top of a dollop of Nutella. After one taste of this, I immediately thought that I may never have to go to the Cheesecake Factory again. Line 12 regular-sized (2-3/4-inch diameter) muffin cups with foil liners (paper ones won’t work here) and lightly grease the bottom and sides [I didn’t grease the foil liners because it seemed like a messy process, and my cheesecake released from the foil after baking OK]. Put the cookie crumbs [I used a food processor to pulse the cookies to a medium to fine crumb] and butter in a small bowl and mix with a fork until the crumbs are evenly moistened. Position an oven rack in the center of the oven and heat the oven to 300°F. Put the cream cheese in a large bowl and beat with an electric mixer fitted with the paddle attachment on medium high until very smooth and fluffy, about 2 minutes. Add the sugar, vanilla, and salt. Continue beating until well blended and smooth, scraping down the sides of the bowl frequently; there should be no lumps. Add the eggs, one at a time, beating on medium speed until just blended. Once the eggs have been added to the batter, it’s important to mix thoroughly without overbeating or the cheesecake will puff and crack during baking. Scoop out 1 cup of the vanilla batter and set aside. Portion the Nutella batter evenly among the prepared muffin cups (about 4 Tbs. per cup). Next, portion the vanilla batter evenly among the cups (about 1 Tbs. in each). The cups should be completely filled. Drag and fold the tip of a wooden skewer, toothpick, or paring knife through the two batters in a swirled pattern. There should still be solid streaks of each batter visible, and the cups should be filled to the brim. Tap the muffin tin on the counter to settle the batters. Bake until the centers barely jiggle when the pan is nudged, 20 to 22 minutes [Mine took a little longer to bake; around 25 minutes]. Set the muffin tin on a rack and let cool completely. Cover and refrigerate until very cold, at least 6 hours. I love that these can be made ahead and refrigerated for up to 3 days or frozen for up to a month.